Lesley Visser is living proof that, no matter where you start, if you are motivated and passionate, your dreams can come true. That answer changed Lesley’s life. Even though no one had done it before, it gave her the strength and self-confidence to try—permission to cross against the light. When Lesley began, the credentials said, “No Women or Children in the Press Box,” but she didn’t let that stop her. Lesley covered sports for more than 40 years, pioneering women’s journalistic presence in men’s professional sports, from inside the locker room to out on the field. She’s the first and only woman to be enshrined in the Pro Football Hall of Fame and to ever present the Vince Lombardi Trophy at the Super Bowl. And she’s the only sportscaster in history to have worked on the network broadcasts of the Final Four, Super Bowl, World Series, NBA Finals, Triple Crown, Olympics, U.S. Open, and the World Figure Skating Championship. Lesley currently appears on CBS’s “We Need to Talk,” the first-ever nationally televised all-female weekly hour-long sports show. In Sometimes You Have to Cross When It Says Don’t Walk, Lesley Visser shares her historic journey through the world of sports broadcasting with innate wisdom and good humor. 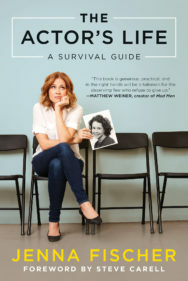 For sports fans who grew up with Lesley, her memoir reads like a walk down memory lane, full of behind-the-camera, VIP-access stories involving John Madden, Jerry Jones, Bill Belichick, Joe Torre, and many more famous sports figures. But even those hearing her story for the first time, no matter what their background, will be inspired to chase their dreams, blaze new trails, and pursue the life they want. Lesley Visser is the most highly acclaimed female sportscaster of all time. 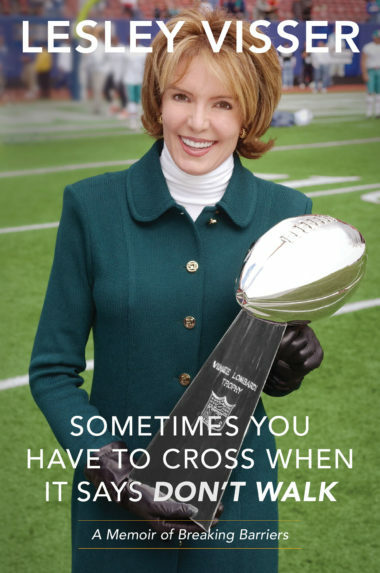 She is the first and only woman in the pro football hall of fame; the only female sportscaster to have carried the Olympic torch; the only woman to have presented the championship Lombardi trophy at the Super Bowl; the first woman on the network broadcasts of the Final Four, the Super Bowl, and the NBA Finals. She was voted the outstanding female sportscaster of all time by the National Sportscasters of America, and was also elected to the Sportswriters Hall of Fame for her work at the Boston Globe, national magazines, and CBS.com. Visser has mentored young women for decades, while speaking at colleges and businesses around the world. A sportscaster at CBS for more than 25 years, she spent nearly 10 at ABC Sports, where she became the first woman on Monday Night Football, while also covering the World Series, World Figure Skating, World Skiing Championships, and the Triple Crown. She has been voted one of the “women we love” by Esquire Magazine and one of “the five ideal dinner guests” by GQ. She and her husband, Bob Kanuth, a former captain of Harvard basketball, live in Bay Harbor Islands, Florida. Dimensions: 8.25 x 5.5 x 1 in.